"...three words, nine word bursts over and over..."
This article is based on canon information, but the article title is conjectural, as there is currently no official name for the subject. See the talk page for more information. Darkblades are a formidable variant of Knight. Darkblades were first introduced in Destiny in the form of Alak-Hul, the Darkblade, a unique Strike boss fought at the end of The Sunless Cell. 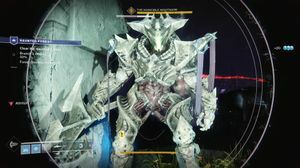 Weaker versions of Alak-Hul were carried over into Destiny 2 as mini-bosses, such as the Abyssal Champion. They are visually identical to Alak-Hul, except for a glowing line on their helmets similar to those of Destiny 2's Knights, and mechanically similar. Darkblades will advance slowly towards the player and attempt to crush them with their axes. Like Alak-Hul, their helmets will break off when they take enough damage, causing them to become enraged and begin rushing at the player in a straight line. While they are easy to outmaneuver, one must be mindful of their surroundings to avoid being cornered while doing so.